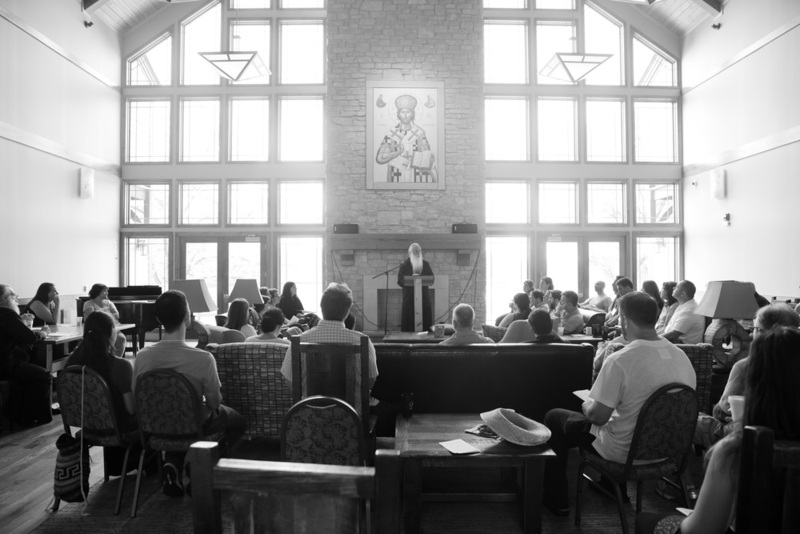 The St. Iakovos Retreat Center features luxurious, communal, and individual accommodations in a 138-acre facility. Completed in 2014, all of the facilities are brand new and function year-round with unique activities for every season! The Main Lodge of the St. Iakovos Retreat Center is a 21,000 square foot, multi-level, all-inclusive building featuring individual style accommodations. It is seated on the shores of Friendship Lake offering breathtaking views of the water and beach as well as the entire property of St. Iakovos. Guests staying in the Lodge can witness views of the sunrise and sunsets as well as the animals grazing in the pasture and the active daily life of the Saint Iakovos Retreat Center. The two upper floors of the building house the 26 guest rooms (300 sq ft each) featuring two double beds and a private bathroom. The rooms accommodate up to two adults and three children with amenities including heating and air-conditioning, access to WiFi, and balconies overlooking Friendship Lake. For added convenience, adjoining guestrooms are also available. The Great Room is the main gathering space of the lodge. This multi purpose room features cathedral style post and beam ceilings, an indoor/outdoor fireplace, and upper balcony overlooking the space. Other amenities include multiple seating spaces and access to WiFi. An outdoor patio is located off the Great Room offering a beautiful outdoor space for people to gather and enjoy the nature that surrounds St. Iakovos. With its central location and multi-faceted functioning, the Great Room is the central gathering space of the Main Lodge, a place where guests can gather for presentations, discussion, and fellowship. The lower floor of the Main Lodge features the Retreat Center Café complete with a cozy indoor fireplace. Food service is offered at St. Iakovos with meals prepared on-site daily with the freshest of ingredients. Our menu includes a wide variety options sure to satisfy everyone. In addition, to the cafe area, the lower floor also includes one to four meeting rooms depending on the needs of your group. The lower level is also home to additional meeting rooms with access WiFi access and a walkout patio featuring an outdoor fireplace and seating space. The Main Lodge is ideal for day retreats and gatherings as well as families or groups seeking overnight individual style accommodations.